Yep, I’m reviewing Canva today. 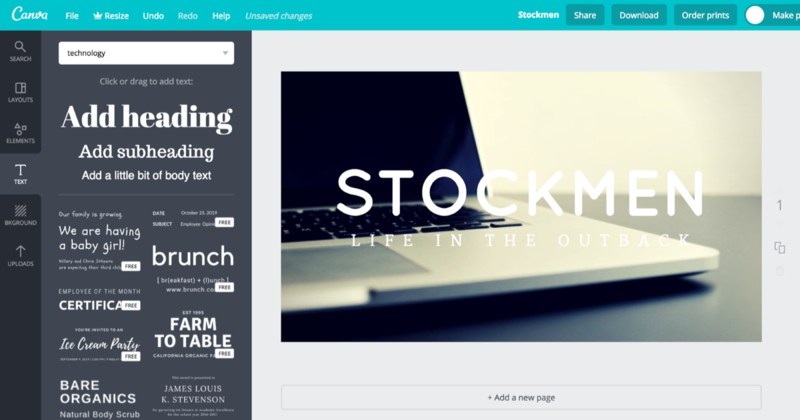 A graphic designer website that makes it easy for anyone to make beautiful websites. More stuff here. 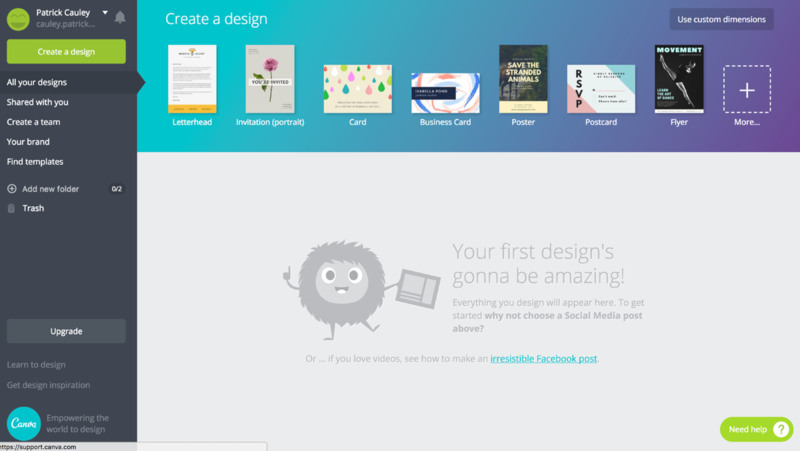 As you can see from the image above, the landing page for Canva is pretty mesmerizing. I just like moving my mouse around to get a glimpse of what Canva has to offer. Do I like it? Well read on. 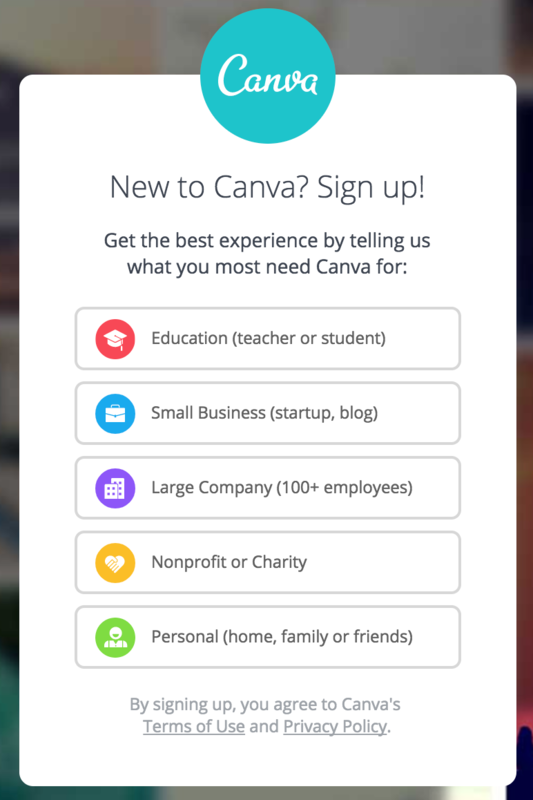 One thing about the landing page I am not a big fan of is it asking me what I want to use Canva for? Why do they need to know? If I pick Education does that unlock other templates that are specific for my career? 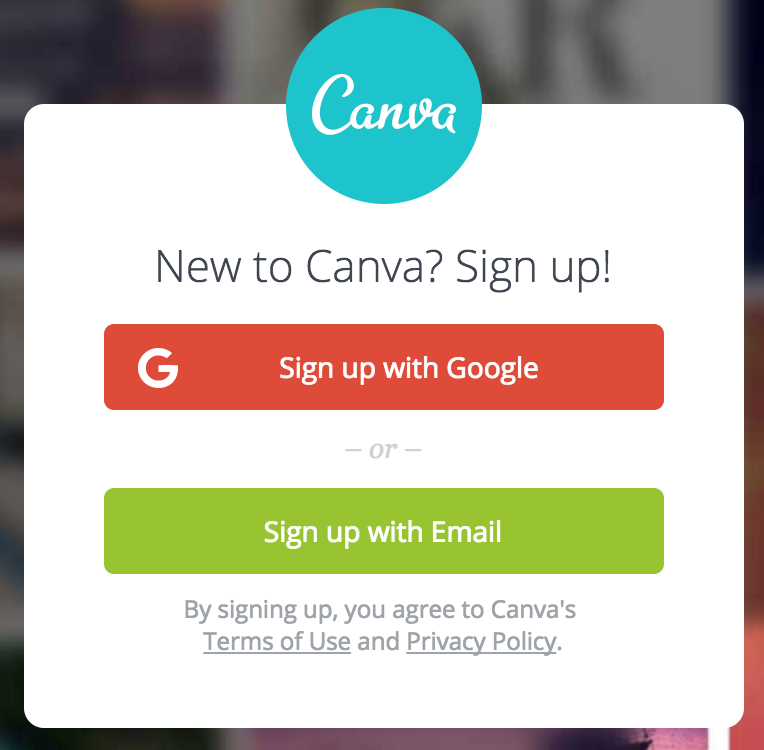 Probably not – I am sure it is just Canva trying to gather more info on its users. Hey, it is a free service so I can’t blame them for asking. Then I get the option to create an account through email or use single sign on with Google. I work at a Google Apps for Education school so I am definitely liking this. It certainly makes it easier for a teacher to point their kiddos to a website and have them click on that Google button. Once you’re in they ask what you do but with a few more options. 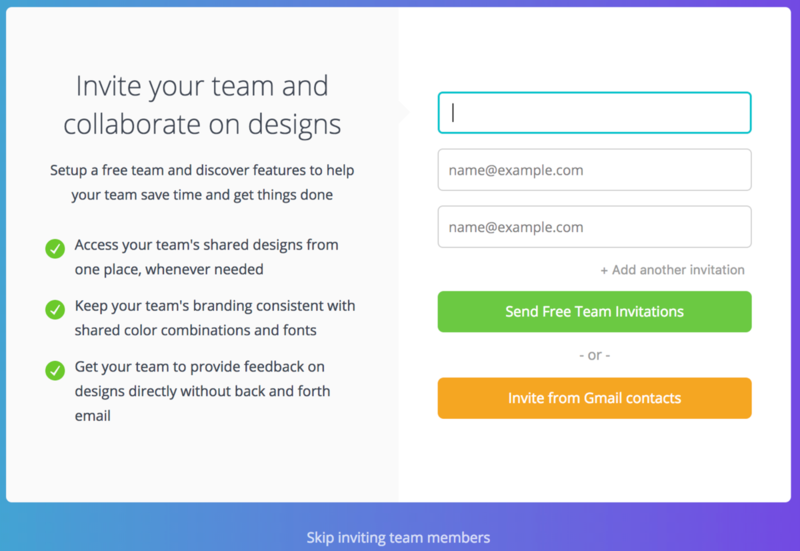 Then they want to know who your team (or who you will be using Canva with). Me, I’m a lone wolf so I’m skipping this step. Don’t worry though, you can add team members anytime you want. Then they want to know what you want to do and they give you some general suggestions. You can click for more design templates or start playing around with Canva right away. For the sake of this I’m going to mess up their workflow and just go to my dashboard. From here you can continue to work on projects, create new projects or just goof around. OK, here we are. After you’ve gone through their very quick tutorials, when you log in again, this is where you end up, the dashboard. It is like most other dashboards. In the far left hand column you have choices where you can navigate to find your projects, projects shared with you, create a team, create or edit your brand (nifty) or find templates. I’m going to start with the templates. Let me just click … whoa! 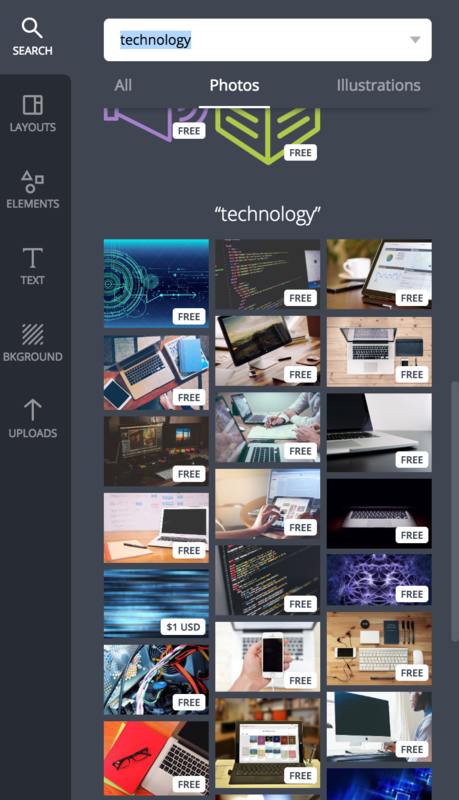 Canva has a lot of templates. They have them broken down by categories (I counted forty five different types!) If you’re a teacher with a wide open project, this is trouble. Give your students some definite feedback. Some of these categories may not be relevant but students are inquisitive and they like to explore. Having too many options can often lead to indecision. Give them some strong direction about what they need to create. Maybe a recipe card isn’t the best choice. For this example I’m going to make a new Web Banner for the IT Babble website. Why not? So I click on Web Banners from the list and I see twelve more options! OK. I want to create a Blog Banner so I click that choice. Now I have … more choices? Not just a few more choices either. I have 4 pages of templates to chose from! Wow, you have to give it to Canva for offering choices. I want a simple banner that will go the width of my blog. After going through the templates (for a little too long I may add) I decided on this layout. I can change it later if I want and I certainly don’t need to stick with the cowboy motif image. OK, I’ve got a layout and that is hard people. You have to look past what the example is. You can change the background photo, fonts, colors, you can change it all. The first element I want to change are the cowboys. It’s a nice photo but I want something tech related, so it’s outta here. To do this simply click on Search and type in technology. It’s that simple. Then find a picture you want and drag it in. You should notice that these pictures say FREE on them, but if you scroll down, that word is replaced with prices. Canva is free to use but those people need to eat and this is one way for them to make money. You can upload your own photos as well, so if you have a logo or some certain artwork that you like, feel free to use it. OK, here is where I’m at now. I have an image but the font being white is washed out. I need to change it somehow. I double click on the title and can edit the words, size of the font, type of font, color, letter spacing. It is actually pretty nice and pretty responsive. Not too slow at all. In order to get to a specific color though I did need to click the + icon. Not a big deal though. 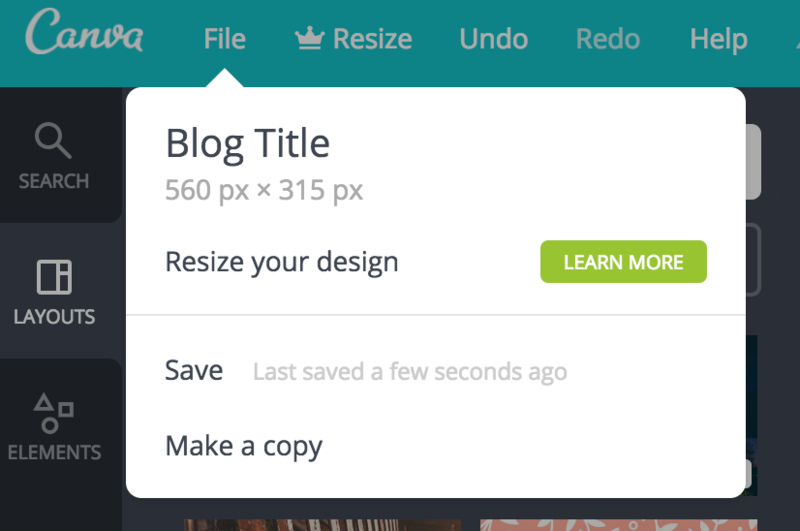 I was easily able to get IT Babble’s signature green in Canva. Now onto changing that font. 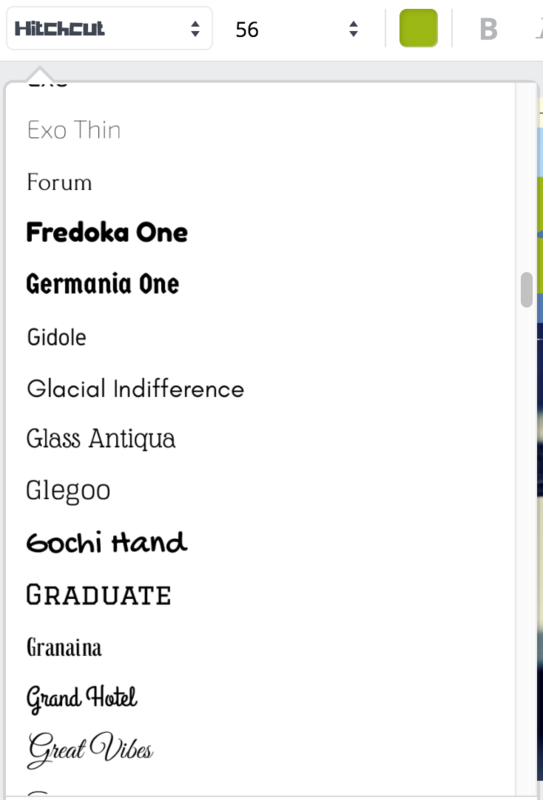 Man, there are a plenty to chose from and even the ability to upload your own font! Overall adding elements was pretty easy and here is what I came up with in about 30 minutes. I’ve tweaked it a little since then, but overall that’s the basic gist of the logo. So now it is time to save it. I have some nice options here. I can download it as. JPEG, a PNG or a PDF. So I will try again tomorrow. Maybe it’s something on their end. Well tomorrow comes and I attempt to download my image but … no. It’s not there. Here is what I am greeted with when I open up my project. I start to delete elements thinking that some things may have been buried but no – it didn’t save my project. The day before and right now there are few people on the network (I’d say less than 15 in the school) and I didn’t observe any disconnection of my Internet at anytime. Yesterday I even “manually” saved it even though Canva is supposed to save as you go. Here is what that looks like by clicking the File menu option at the top. Not a big deal for me – it was only thirty minutes worth of work but I am thinking of a class of twenty five students and if this happens to three of them – that is a problem. That causes other students to have to play catch up. It causes the teacher to dedicate a lot more time to just a few wayward souls. It is a disruption and a big one at that. I hope this is just a one off, so I checked their support page and it appears that this has happened to enough people that they do have a page dedicated to it. The bottom line, it looked like it saved for me but it actually didn’t. It also turns out I needed to resize the image anyway and that resizing an already created image is a paid feature. Again, not a big deal, I’ll start from scratch and make a web banner for IT Babble (my WordPress blog page has a recommended banner dimensions of 940 x 180). So to create an image with custom dimensions you need to push the Create a design button from the dashboard. From here click on the Use custom dimensions button as pictured below. When you click that it wants your dimensions in pixels. You can chose between inches or millimeters but I like to work in pixels, so there. After you’ve given your dimensions it takes you to the editing page and it wants to know what layout you want for your banner. Pretty nice, I like that. I just want a banner that is a single issue that stretches across the page. Now, I’m at the point where I want my logo, so I add it and crop it and it looks good but I keep getting this little message. So a little research and I found that if I use a frame element then my logo which has a transparent background will run into problems. I am not using that type of element so I go ahead and try to download my banner … again. So let me put it on my blog and let’s see what we can see. Well, as you have seen it looks a little compressed and not nearly as sharp as the original image downloaded from Canva. This is a WordPress issue though folks and not Canva. Let’s wrap things up. 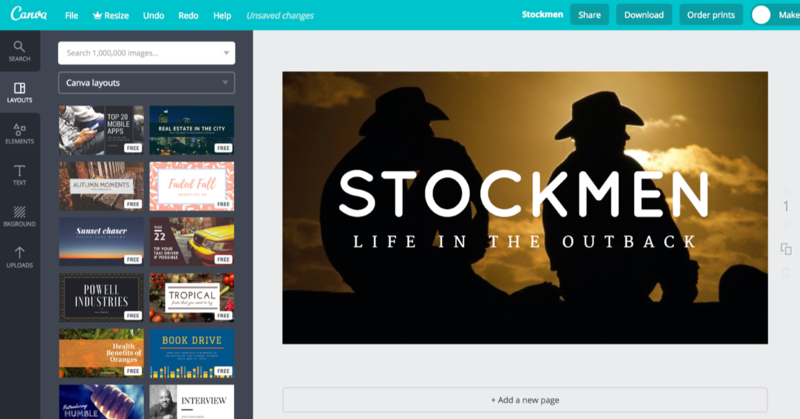 The big question here is whether I would use or recommend Canva for classroom use? I do recommend it but with this caution. Prepare students that they could lose their work and prepare time in your lesson to address those students and how to handle it (give them extra time, grade them differently than their peers, etc). The amount of choices could be also be a problem as I mentioned earlier. As a teacher you will need to give some clear choices for students before starting a project with Canva. If not, they could spend days trying to find the “perfect size.” I know of my first thirty minutes I spent a good ten just working out what template I wanted to use for my banner. Maybe stay away from those templates at first. It’s a good product, it really is. It gives a tremendous amount of options and a lot of creativity. The ability to make your own custom dimensions is great and the royalty image search and vast amounts of grids, frames, shapes, illustrations and more make it pretty good. I’ve seen other sites like this and you can often get that cookie cutter feel where everything your students would create would be very similar. Here I feel that there are enough choices that you won’t always run into that problem. I do wish there was a little more choices when it comes to text. All the basics are there, you can change the font, color, size, alignment and character spacing. I wish you could add a stroke (outline) to the text in addition to adding a gradient or some basic transformations (perspective, putting it on a path, etc.). 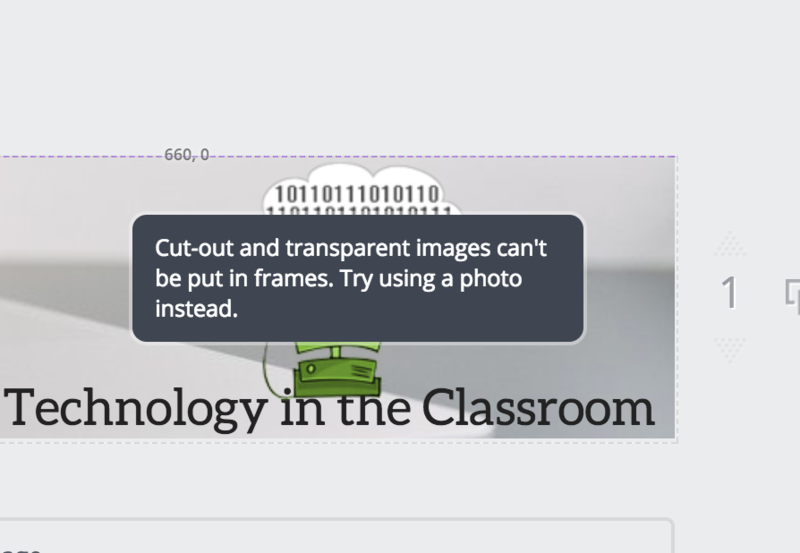 Overall I was impressed with Canva but the fact that it didn’t save my first project worries me and as a teacher I would test it out with a small group first before going full blown with it. 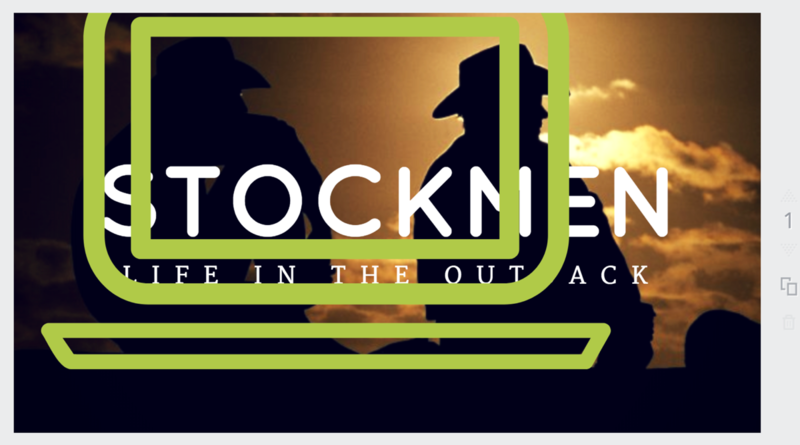 This entry was posted in Patrick Cauley, Review and tagged canva. Bookmark the permalink.